But not your little dog, because contrary to several canine-centric pages, your little dog should not be using Facebook. Spooky Cool Labs is bringing the classic film to Facebook, potentially creating the world's first million member yellow brick road march. An article over at The Hollywood Reporter this morning describes a fully 3D adventure that follows Dorothy, the Tin Man, the Scarecrow and Mrs. King the Cowardly Lion on their quest to find Oz and get the world's oldest little girl back to Kansas. Spooky Cool Labs' page describes a game in which players create their own Munchkinland, creating and caring for their own stable of small people, dressing them up, making them wear tiny hats. 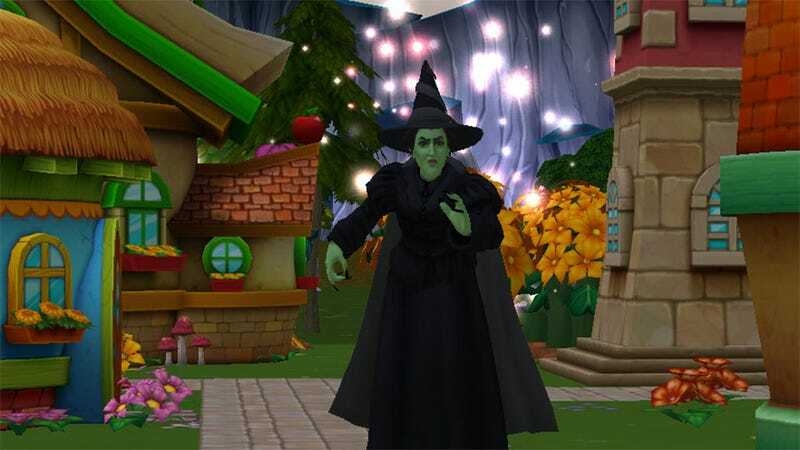 It's a town builder with a Wizard of Oz theme — an incredibly pretty town builder. The game is currently in beta, with Spooky Cool regularly giving away keys on its Facebook page, so if you're keen to play, I'd hang out there. You can even bring your dog.